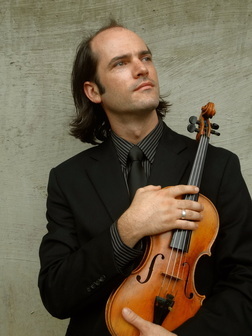 Aaron Packard maintains a varied career as a violinist, performing music of many genres and periods. He is an avid improviser and proponent of new music, working closely with composers such as U.S.-born Norway resident Ellen Lindquist, and Elizabeth Adams and Ted Hearne in New York, to find and experiment with new sound ideas. Having studied period performance with Arthur Haas at SUNY Stony Brook, his interpretations are also informed by the strength of tradition and history. He currently teaches at the Joy of Music Program in Worcester, MA, and at the Groton School in Groton, MA. Performance collaborators include Orfeo Duo, 17th-century specialist and improvising harpsichordist Gabe Shuford, Mantra Percussion, violinist Vita Wallace, and bassist Nick Walker. He has been a frequent guest with Avery Ensemble, presenting works from Beethoven to Schnittke. Since 2007 Aaron has been honored to perform in and around Saranac Lake, NY as a part of the Loon Lake Live concert series. Major violin teachers include Greg Fulkerson and the late Mitchell Stern, but he is proud to say he was really started on the path toward becoming a listener by the incomparable pianist Gil Kalish, and Tim Eddy of the Orion String Quartet. While at home, Mr. Packard spends time meditating on breath and movement, raising chickens, and loving life with his wife and two young children.